You may have a slightly older copier in your office, but everything works just fine. Then, suddenly you get a call from your leasing company. They inform you that the copier has been discontinued and that it’s smart to upgrade to a new model. But your current copier is working just fine. You don’t necessarily have to upgrade, it’s just important to realize the implications of maintaining a discontinued copier. There is a good chance this salesperson is just looking for an opportunity to make a little extra cash. You see, copier companies want their newest models in offices, and the older ones in the trash. This means that the salespeople are going to do whatever they can to get you to upgrade. Your salesperson may offer a deal, saying it’s only an extra $50 for the new copier. You may not need a copier and are reluctant to upgrade. They might tell you that it is hard maintaining a discontinued copier, but there is something they’re not telling you. Copier companies must keep copier parts available for 5 years after they discontinue a copier. This ensures that people aren’t bullied into buying new machines. That means that if your copier is within that five year span, then it should be very easy maintaining a discontinued copier. 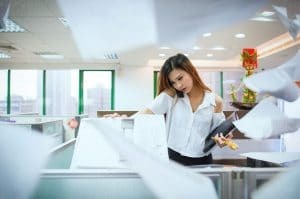 You just need to be aware that after the 5 years are over, then it may truly be difficult maintaining a discontinued copier. You just need to learn about your copier. If your copier lease is only for 2 more years and the copier just got discontinued the previous week, then you should be fine without upgrading. If you have a copier that is already 4 years into its discontinuation, and you have just begun your lease, then you may need to upgrade. Not every salesperson is lying, it’s just important to inform yourself. Don’t get tricked into buying something new when your old copier works just fine. Knowledge is power and at Spokane Copier we want to make sure you know as much as you can. To find the best copier leases in Spokane call today. We can get you the fairest lease around, without the hassle.